Imagine all the content created from the dawn of recorded history all the way up to 2003. Cave paintings, Renaissance artwork, Egyptian hieroglyphics, sacred texts, romance novels. The whole grand multicultural enchilada. How long would it take us, in 2016, to replicate that staggering volume of content? According to Google’s Eric Schmidt: 48 hours. Humanity creates more content every two days than our ancestors managed in 6,000 years. Those slackers. Sure, that’s an impressive achievement for the human race (quality of the output notwithstanding), but it’s a challenge for every marketer hoping their content finds an audience. With multiple civilizations’ worth of data published every day, how can even the snazziest of infographics earn attention? 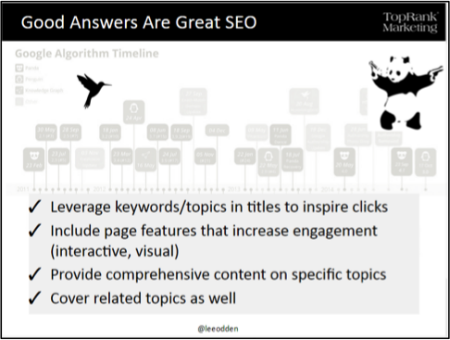 TopRank Marketing CEO Lee Odden has spent a decade learning what kind of content stands out from the rest. The solution is simple to say, but complicated to implement: your content must be the best answer to your customers’ questions. To get the maximum amount of links and shares, to drive long-term search engine results, your content must be the best answer. Not content that showcases your products’ features. Not content that features .gifs of dancing cats (though it couldn’t hurt). Not even content that’s the second-best answer. So, there you have it. Just be the best answer, and your audience will come to you. Now there’s just one small detail to figure out: How? Lee tackled this issue in a recent webinar hosted by BuzzSumo Director Steve Rayson. Under Lee’s direction, TopRank Marketing has helped countless clients be the best answer in their respective industries, from small local businesses to Fortune 50 enterprises. You can watch the presentation below, or scroll down for the takeaways. Useful and informative. It seeks to answer a question, not bait-and-switch customers into purchasing a product. Is your company qualified to answer the question? Do you have a reputation for knowledge in the field? If you need help here, consider partnering with influencers to add credibility. High Quality. The best answer tends to be an in-depth exploration of the topic, including related topics where relevant. 5-point blog posts are all well and good, but you can show more value by going in-depth. The content is not only relevant and informative, it’s entertaining to read. Better than the Competition. Writing content that is better than your competitors’ requires research. Read what others have written on the topic, find unmet needs, and use your content to fill in the gaps. While SEO best practices are still important, quality content is the best SEO. When people are compelled to share and link to your content, search engines move you up in their rankings. The key is to go deep while still being entertaining. Use video and photos to keep readers’ interest. It’s worth investing in the resources to create visual content that pops. And don’t forget crosslinking: Your comprehensive “best answer” content should link to external, and especially internal, resources that provide more information or offer next steps. They make a big promise in the title, and actually deliver in the content. So what’s the best way to compete with the mountains of content out there? According to Lee: Stop creating content. Just stop. When you answer these questions with deep, informative, entertaining content, you can earn attention. Continually deliver quality content that speaks directly to your customers’ concerns, problems, and pain points, and you can earn their trust. 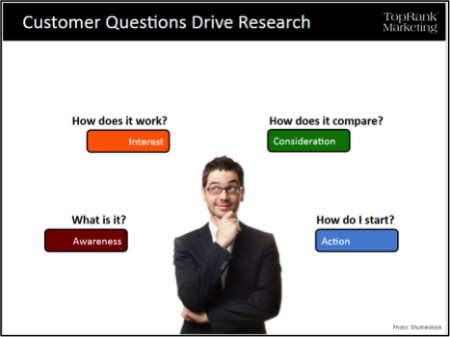 Address each part of the buyer’s journey with “best answer” content, and you can gently lead them to the logical conclusion that your solution is what they’ve been searching for. Want to learn more about content marketing strategy?